The Korean War started in 1950, and so did the history of the Land Cruiser. The American Army needed utility vehicles, and Toyota delivered. In 1951, Toyota had a first prototype, more powerful than the U.S. Jeep, with a 84 hp 6-cylinder gasoline engine. In 1953, mass production started, and the “Toyota Jeep BJ” was shipped across the water to eager customers fighting the Communists in Korea. In 1954, the BJ was named “Land Cruiser,” an unabashed reference to the British competition, the Land Rover. The BJ morphed into a slightly demilitarized J20. A 1960 refresh turned it into the classic Land Cruiser 40. It finally had what soldiers had sorely missed in the mud and snow of Korea: A gear box with a low range. In 1965, when the truck in the picture was made, the Land Cruiser 40 was the best-selling Toyota in the U.S. In 1974, the Land Cruiser 40 was available with a diesel engine. Lower taxed in Japan than the gasoline engine, the diesel propelled the sales numbers of the Land Cruiser 40 to new heights. In 1983, the last Land Cruiser 40 was exported to the United States. A comfort-oriented Land Cruiser 55 was produced from 1967 to 1980. The more modern looking Land Cruiser 60 series was made from 1980 through 1990. In 1984, the 70 replaced the 40 as the blue collar worker in the Land Cruiser family. The 70 was available in three wheelbases, short, medium, and long. A lighter duty version was sold as the Land Cruiser 70 Prado. The Land Cruiser 70 maintained its classic shape through 2007, when it was facelifted. The Land Cruiser 80 was launched in 1990. The 80 was replaced by the Land Cruiser 100, and the gentrification of the former workhorse was in full swing. 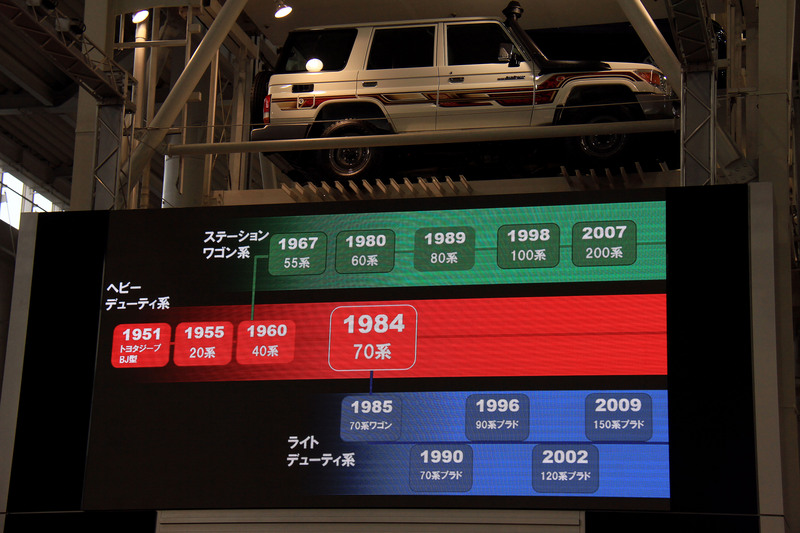 Confused by the many members of the Land Cruiser family tree? Toyota explains it in that handy slide. Wagon green, Heavy Duty red, Light Duty blue. All these trucks, and a few more, can be seen at Tokyo’s Megaweb. If you hop on a plane now, they will still be there. Each one of them is well worth the ticket. This entry was posted in Uncategorized and tagged Bertel Schmitt, Japan, Land Cruiser, Toyota by Bertel Schmitt. Bookmark the permalink. The pictures are truly awesome. Very nice post depicting the history of land Cruiser.